Basingstoke Community Court was named the Police Support Volunteer Team Award winners at the Lord Ferrers Awards last night (October 16). The awards recognise outstanding contributions to volunteering in policing across the country. Basingstoke Community Court was launched in June 2016 and in that time they have heard more than 100 cases involving young people. It was set up to reduce re-offending and provide better outcomes for young people in relation to low level offending by being accountable to a panel of their peers. It also allows victims to have a greater voice in the process. The court is staffed by 12 volunteers aged between 14 and 25, all of whom are balancing work or school to help Hampshire Constabulary. Their impact has been impressive with Basingstoke seeing a 10 per cent re-offending rate, compared to a national rate of 42 per cent. Hampshire Constabulary works in partnership with Safer North Hampshire to make this scheme a success. So much so that Basingstoke Community Court is now seen as the model when expanding to other areas in Hampshire and across the country. 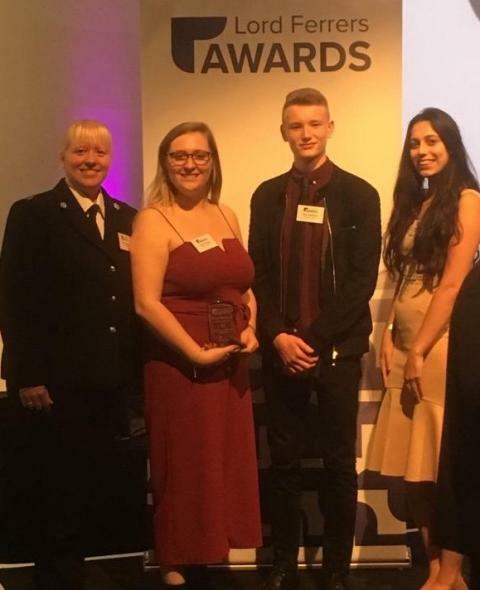 Yasmin Webb, Tom Lovelock and Sherrie Thomas represented volunteers from Basingstoke Community Court at the ceremony, along with PC Karen Binney and Katie Walker from Safer North Hampshire. PC Binney said: “I am very proud that the volunteers have been nationally recognised for their ongoing commitment to their community. “These young people consistently give up their own time with the ambition to make a difference in their community that they live, work or attend school in. “The programme has not only been proved to reduce reoffending in youths, benefitting the residents of Basingstoke but also gives a greater understanding to the victims about why a crime happened to them and gives them a voice.